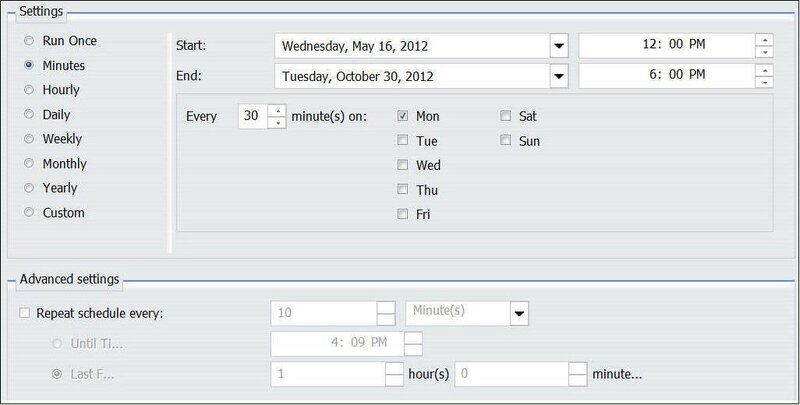 When you access the Basic Scheduling tool, the Recurrence tab options allow you to define how often to run the schedule. The following image displays the Recurrence tab in the Basic Scheduling tool. You can assign start and end times by using the drop-down lists. 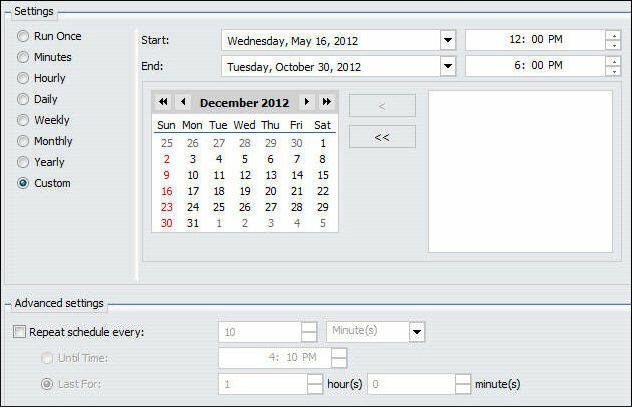 When you click on the down arrow, a calendar will display that enables an authorized user to set the date for schedule distribution. Use the up and down arrows to set a specific time for schedule distribution. Alternatively, you can enter the time manually. If the user has the privilege to set Advanced settings, check the Repeat schedule every check box to enable Advanced interval setting options. Set how often you want to repeat schedule distribution, when you want to stop distributing the schedule (Until Time), and the duration to distribute the schedule (Last For). Enter this information manually or use the up and down arrows to set parameters. The Run Once option sets the job to execute immediately. This is the default value. You can modify the date or time if you do not want the schedule to run immediately. 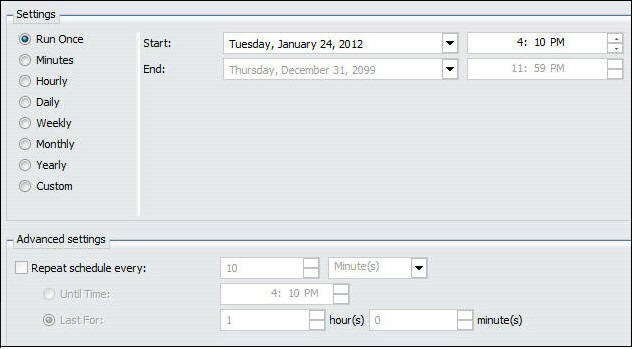 You can specify the date and time you want the schedule to run using the Start Schedule options, as shown in the following image. To select a date, choose a date from the drop-down date calendar. 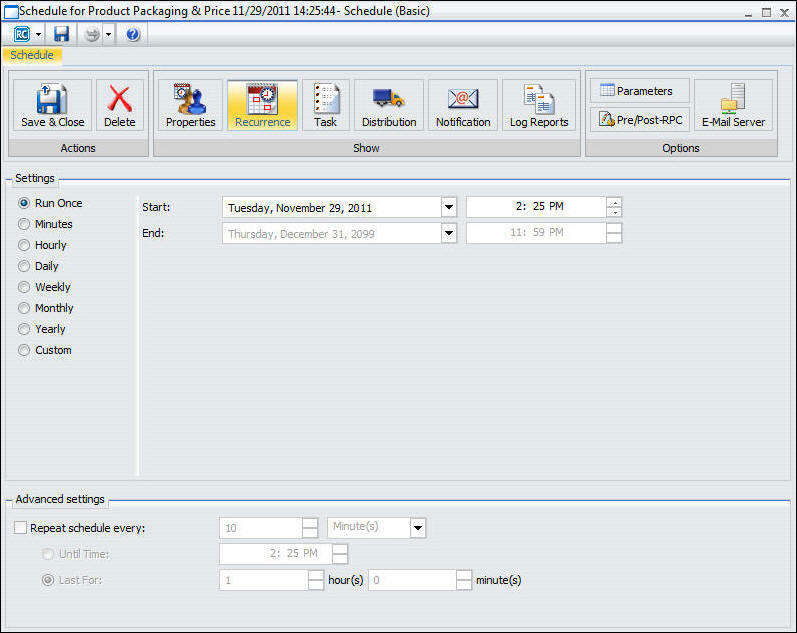 To select a time, select either the hour or minutes and use the up and down arrows to increase or decrease the value. Alternatively, you can enter the time manually. The Minute(s) option sets the schedule to run every n minutes. 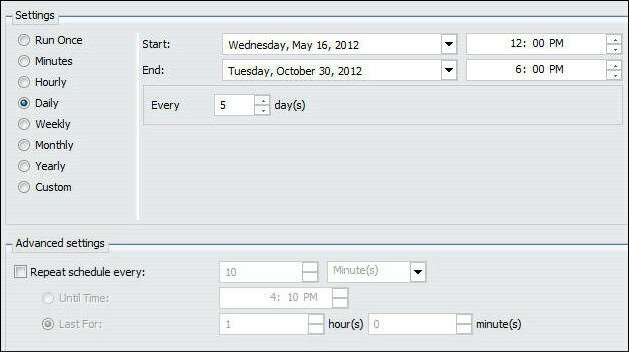 In the Every minute(s) field, type or select the minutes interval (1 to 59), check the days of the week on which you want to run the schedule, and select the Start and End date and time to define the time period in which the schedule will run. For example, the following schedule will run every 30 minutes on Mondays beginning at noon May 16, 2012 and ending 6:00 PM October 30, 2012. Tip: Selecting this option may affect system performance if you choose to run the schedule every 5 minutes or less. We recommend specifying a minimum of 30 minutes. The minute interval option is primarily for alert schedules. The Hourly option sets the schedule to run every n hours. 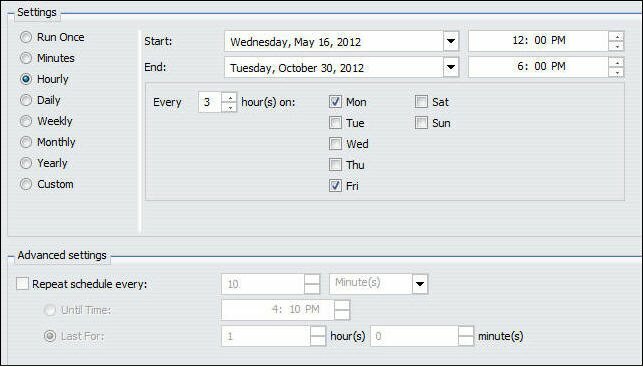 In the Every hour(s) field, type or select the hours interval (1 to 24), check the days of the week on which you want to run the schedule, and select the Start and End date and time to define the time period in which the schedule will run. For example, the schedule shown in the following image will run every three hours on Mondays and Fridays beginning at noon May 16, 2012 and ending 6:00 PM October 30, 2012. The Daily option in the Run Interval drop-down list sets the schedule to run every n days. 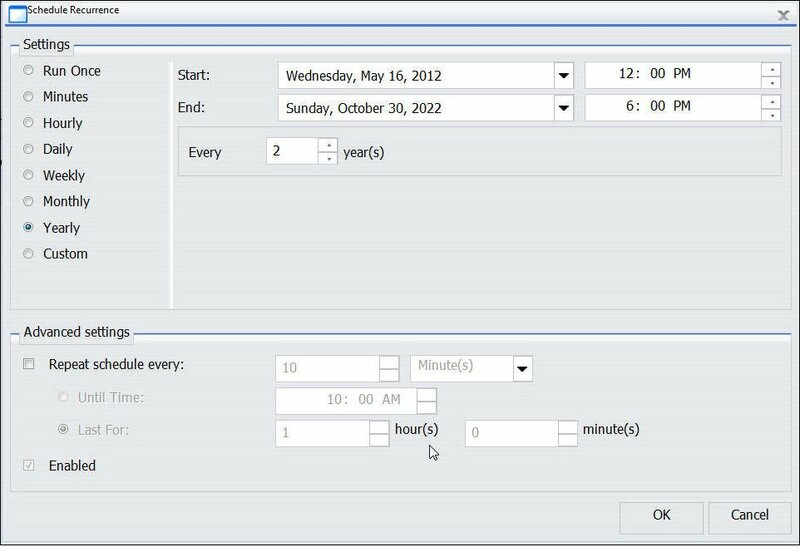 In the Every day(s) field, type or select the days interval to run the schedule and select Start and End date and time to define the period in which the schedule will run. For example, the schedule shown in the following image will run every five days beginning at noon May 16, 2012 and ending 6:00 PM October 30, 2012. You can also set a secondary run interval. For information about this setting, see Advanced Settings. The Weekly option in the Run Interval drop-down list sets the schedule to run every n weeks. 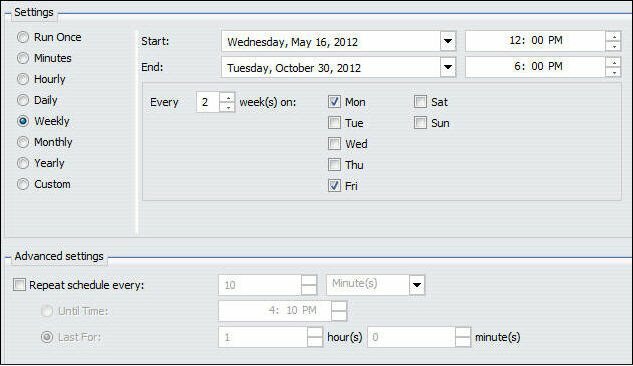 In the Every week(s) field, type or select the weekly interval to run the schedule, check the days of the week on which you want to run the schedule, and select the Start and End date and time to define the time period in which the schedule will run. The following schedule will run every two weeks on both Monday and Friday beginning at noon May 16, 2012 and ending at 6:00pm on October 30, 2012. Note: When selecting the Weekly interval, set the Start to the date of the first day (current or future) of the week you want the schedule to run. If you select the current date, then you must make sure that the Start time is later than the current time when you save the schedule. If the Start time is less than or equal to the current time, the calculation for the next run time results in the schedule not running on the current date. You can also set a secondary run interval. For more information about this settings, see Advanced Settings. The Monthly option sets the schedule to run every n months. You can then refine the monthly interval with one of the following options. Note that these options are mutually exclusive. Every first, second, third, fourth, or last n day of the week (where n is Monday, Tuesday, Wednesday, Thursday, Friday, Saturday, or Sunday) every n months. Specific days every n months. Also select the Start and End date and time to define the time period in which the schedule will run. The following image shows a schedule set to run on the first Monday of every month beginning at noon May 16, 2012 and ending 6:00 PM October 30, 2012. The following image shows a schedule set to run on the 2nd, 9th, 16th, 23rd, and 30th of every month, regardless of the day of the week those dates fall on. You can also select the Last Day of the Month option at the end of the calendar to run the schedule on the last day of the month. Note: When selecting the Month(s) interval, set the Start date to the date of the first day (current or future) of the month you want the schedule to run. If you select the current date, then you must make sure that the Start time is later than the current time when you save the schedule. If the Start time is less than or equal to the current time, the calculation for the next run time results in the schedule not running on the current date. The Yearly option sets the schedule to run every n years during a specific time period. The following image shows a schedule set to run every two years beginning at noon May 16, 2012 and ending 6:00 PM October 30, 2022. 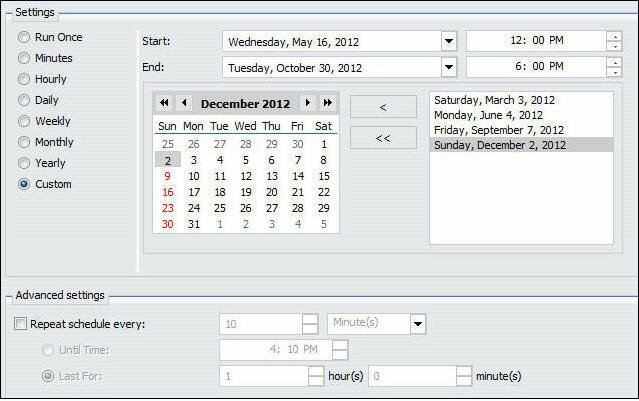 The Custom option allows you to select a set of dates that do not follow a specific pattern. For example, if you want to run a quarterly report on a different day of each quarter, then you can use the Custom run interval to set the schedule to run on dates such as March 3 (Saturday), June 4 (Monday), September 7 (Friday), and December 2 (Sunday). 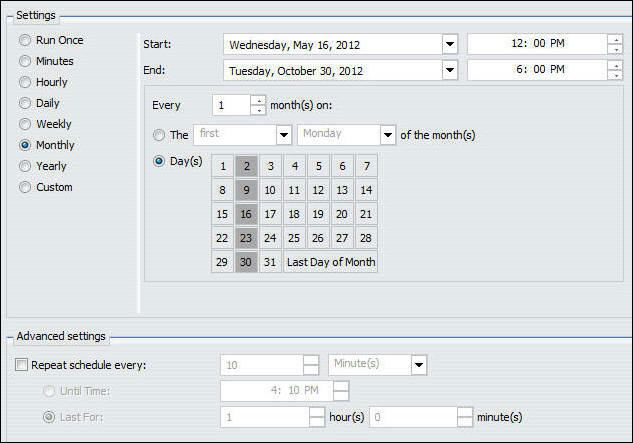 The following image shows the Custom Run Interval options, which includes Start (initially set to the current date and time) and the End date and time options, the Custom calendar, and the Custom Date List node that appears in the right panel. Define the time period in which the schedule will run by selecting the Start date and time and the End date and time. Select the specific days on which to run the schedule by clicking the day in the calendar. (Use the forward and back buttons at the top of the calendar to move through the months and years.) As you select a date, it appears in the Custom Date List. If it does not already exist, a folder for the year and month of the date you select is automatically created under the Custom Date List node. 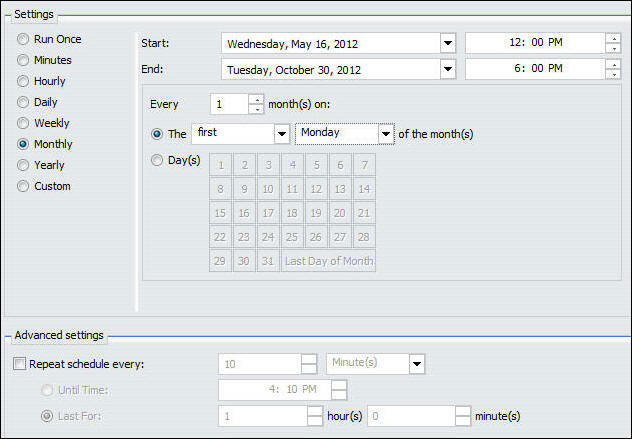 The following image shows an example of a selection of Custom dates in the calendar and the Custom Date List. To remove a date from the list, click the date in the calendar. The date is no longer highlighted in the calendar and will not appear in the Custom Date List. You can optionally use the left single arrow to remove a date from the list. The double arrow button removes all defined lists. You can also set secondary run interval. For information about this setting, see Advanced Settings.